Huszar opened recently in a part of town that I believe may be the edge of the world. (It used to be a local dive called Recovery Room.) Basically Huszar lodged up against I-279 in between the North Side and Deutshtown, or as I like to call it, East Allegheny. There's a wonderful view of Pittsburgh rush hour traffic only steps from your bar stool. There were so many dishes that I wanted to try on the Huszar menu that I basically gave up and ordered the most expensive item listed in order to appease my foolish sensibilities. Pictured above is one of the most intimidating happy hour meals I've been served in ages. 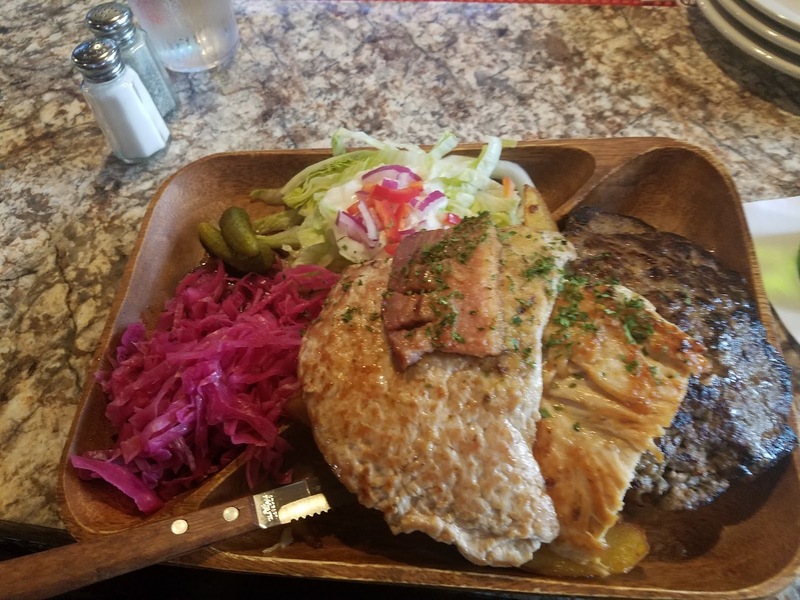 The Transylvanian Wooden Platter comes with chicken, pork, and steak served with fried potatoes and a couple of side salads. I shared this entree with four people and still had more than enough for dinner. It was a real bargain at $24.95. Out of the three meats the steak was my favorite, quite tender and flavorful. On my next visit I would be interested to try the goulash, the taste of Huszar appetizer platter, the Hungarian burger, the chicken paprikash or the beef stew. Essentially every item on the menu is my soul animal. My experience at Huszar reminded me of my wonderful time in at Apostila in Prague several years back. If you really want to explore all that Huszar has to offer, go check out one of their special events. Currently, the Gypsy Stringz band plays there once every other week and the bar gets packed. Start slowly with one of the Czech pilsners and work your way up to some slivovitz. Also be sure to make a reservation.